In April 2010 Museum of London Archaeology started a thematic survey of assemblages of hulked vessels in England. This work was funded by English Heritage, under the Historic Environment Enabling Programme. Hulks are defined as ships that have been stripped of their fittings and permanently moored within intertidal areas, estuaries, canals and rivers, and for the purposes of this project an assemblage is classed as two or more hulks within 50m of each other, such as the group shown on the aerial photograph below at Barksore Marshes. The main data sources for the survey were local authority Historic Environment Records). Each HER in England was contacted and all data related to hulks was requested. Other data sources included Regional Rapid Coastal Zone Assessments), also funded by English Heritage; and surveys of harbours and estuaries by Maritime and Nautical Archaeology Societies and University departments. These included the River Itchen Project the Hamble River Project the Purton hulks project and the Forton Lake Project. 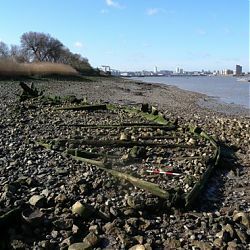 MOLA adopted a multi-disciplinary approach to the project, drawing on internal expertise in vessels and foreshore archaeology along with close links with the Nautical Archaeology Society and the Thames Discovery Programme, which have been at the forefront of developing methods of recording and monitoring archaeological remains on the foreshore. The results of the survey are currently being assembled and are due to be written up by summer 2011. 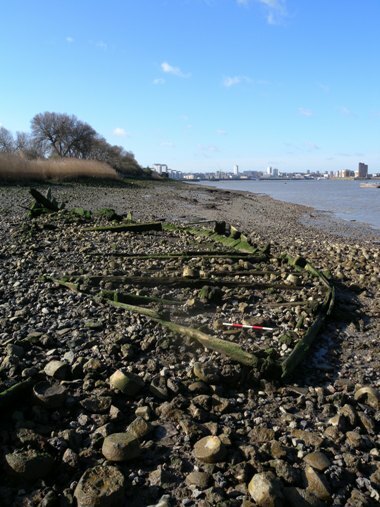 Initial results indicate that there are almost 200 known assemblages of hulked vessels located above the line of low water in England, and over 500 individual hulks. The largest assemblage by far is that at Purton in Gloucestershire, with over 80 hulks. 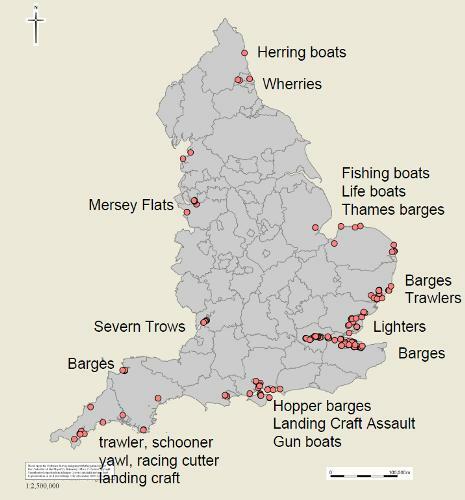 Other large assemblages include 26 barges on Barksore Marshes, Kent; over 25 Mersey Flats at Sutton Locks, Weaver Navigation, Cheshire; and 22 hulked vessels at Holes Bay, Poole, Dorset. 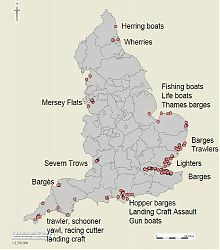 Vessels types have been recorded where possible, and their distribution around England show clear regional differences, as shown on the map (orange dots are assemblages). Vessel types recorded in this survey that are not already in the NMR Thesaurus will be added. It is hoped that the survey will enable us to identify specific sites that would be suitable for further detailed hulk surveys, and possibilities for inclusion of local groups in surveys and future management of assemblages.